Yes, I have had Sprinkles too. I recently stayed up in LA with a friend and we kept going back & forth from Westwood to Pasadena. She had heard about Dots and wanted to try it, so we went. The prices are $1.25 for the mini's but I think the regular sized cupcakes are more worth it, $2.75. Both Sprinkles and Dots use very similar themes and design. I tried looking up online which came first, but I think Sprinkles was. Apple Pie was my favorite. It was just the right amount of sweetness and fruit inside. Like I have said before, I hate cooked fruit. So to my surprise I actually really liked this cupcake. 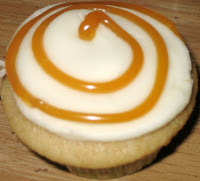 It was moist, flavorful, and not too sweet even with the caramel. 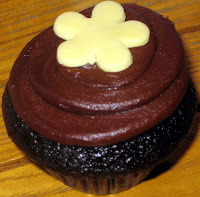 Although, I recommend you to have milk or some liquid around to lower the sweetness as you eat more cupcakes! One is never enough! 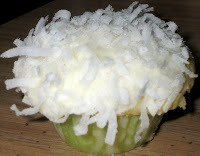 Piña Colada was actually a pretty good idea to make as a cupcake. At first I thought it might taste weird, but it sounded very interesting so I had to get a mini. 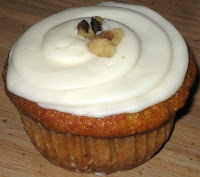 It has a subtle flavor and was well balanced with the frosting. Strawberry Shortcake was good. I think I would have gotten a better taste if I didn't order the mini. It was moist and light, not too sweet. The mini barely had any strawberries inside. Chocolate Chocolate was only okay in my opinion. Not anything special that I would die for. I got it because my friend kept emphasizing about the Valrhona chocolate. I like chocolate cakes, but this one was so-so. It isn't that sweet since it was Valrhona chocolate. The frosting should have brought out the flavors of the cake but it did not. 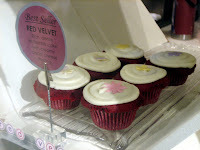 Red Velvet is there signature, best seller, cupcake. I actually liked it. My friend didn't think much of it. I have had the one at Sprinkles and I think their frosting totally KILLS the cake. It was WAY too sweet. When I ate Dots I thought that the cake was moist, not too sweet, and the frosting brought out the flavors of the cake. 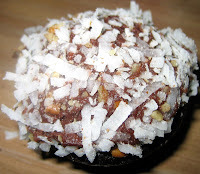 German Chocolate was my least favorite. I don't know why but there was this funky after taste in my mouth. First I tasted the chocolate then I felt this discomfort in the back of my throat. Personally I would rather have the Chocolate Chocolate. The service was fine. A lot of people complained about them being snooty, but I didn't encounter that. 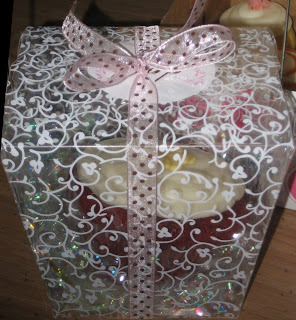 They offer wrapping and it is so cute! 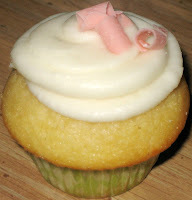 I opted to get one of my cupcakes wrapped for no reason except for me to feel pretty and special while looking at it. It was only 75 cents, so that wasn't bad. I think they would make wonderful party favors for weddings, parties, or baby showers. All in all, I'd come back if I was in town. 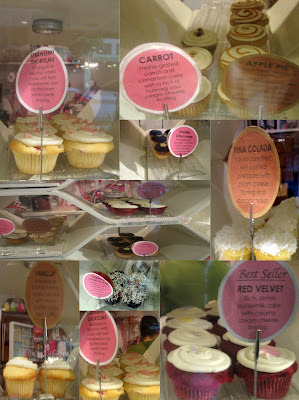 Of course, I will be up in LA tomorrow and I am asking my friend to get me some cupcakes from here on her way back to meet me in Westwood. ^_^ Got to love friends! I've been to Dots, Sprinkles and also Crumbs. Hands down, Dots is first prize. Sprinkles were in last place for me, and while the product is very artistic, the taste was not my cup of tea.